QFSGen is a cross-platform, command-line utility that generates a ROM-based file system, which can be incorporated in a C source code. Specifically, QFSGen utility generates a C header file that contains a bunch of constant byte arrays representing your files and directories. This generated header file (named fsdata.h by default) can be subsequently included in the ROM-Based File System implementation. QFSGen is deployed as natively compiled executable and is located in the sub-directory qtools/bin/. 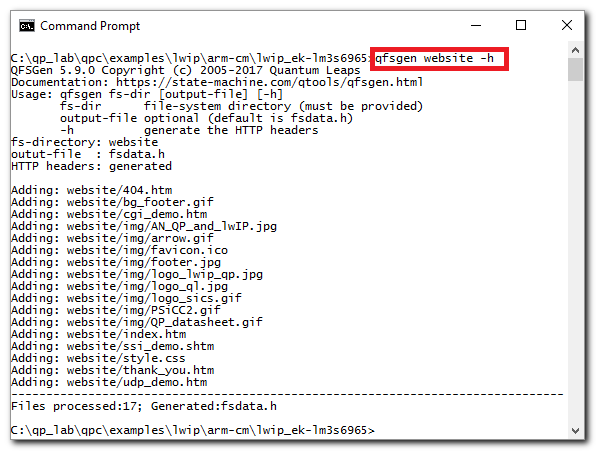 QFSGen is available in portable source code and can be compiled on all desktop platforms (Windows and POSIX – Linux, macOS...). The main motivation for the QFSGen utility is to generate ROM-based file systems for embedded HTTP servers. However, the utility can be used for any ROM-based file systems. where website is a directory, which contains the files and sub-directories you wish to include into your ROM-based file system. This particular QFSGen invocation will generate the file-system found in the directory website with HTTP headers (-h option). Subsequently, the fsdata.h header file is included in the ROM file-system implementation file fs.c, which is included in the qfsgen/source directory.